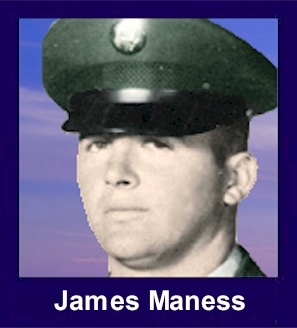 The 35th Infantry Regiment Association salutes our fallen brother, PFC James Emory Maness, who died in the service of his country on September 2nd, 1967 in Quang Ngai Province, Vietnam. The cause of death was listed as Booby Trap. At the time of his death James was 21 years of age. He was from Talladega Springs, Alabama. James is honored on the Vietnam Veterans Memorial at Panel 25E, Line 86. The decorations earned by PFC James Emory Maness include: the Combat Infantryman Badge, the Bronze Star, the Purple Heart, the National Defense Service Medal, the Vietnam Service Medal, the Vietnam Campaign Medal and the Vietnam Cross of Gallantry with Palm Unit Citation. There was a fella that I met some years before this nightmare began for us. We had met and fought over, what else, a girl. After this was all said and done, we became good friends. We went in together and paid 50 bucks for a 1932 Ford deuce coupe sitting in a farmers field, on blocks and timbers. After scavenging 4 tires, we rolled these tires by hand 26 miles, took most of the day. We then pushed the car by hand back 26 miles. This was our first car ! We stayed up for 2 days and 2 nights and tore down the mill. We even did a little "midnight auto" shopping for parts and gas. Well, after that we got it licensed. We were a hot item and ready to cruise the drag here in my home town of Great Falls, MT. Every Friday and Saturday night, we used to take my mom downtown as she was divorced and trying to live her life and loved Jimmy like a son. He was a kid from the Arkansas area, living up here with his sister. Well, with no job and now we had a car, we needed to get finances. I was living in a housing project at that time and I knew of a couple of guys wanting to start a band. One thing lead to another and after what seemed like eons of practice, we became the number 2 band in the state. Jimmy had a beautiful voice from soprano to baritone and boy could he swoon the women. Well, it then became evident that we all had to go our separate ways, duty calls. Jimmy, if theres one thing I want us to remember is this: Friends are easy to find, but GOOD friends are harder to keep." Sleep well my friend. Ill be seeing you soon enough, maybe when I get there, we can start another band and rock heavens gates!